However, don't take Samsung's inability to come up with the killer phone camera with stagnation. Quite the opposite - Samsung has been trying out new things in the camera department in the past couple of years, utilizing features like variable aperture, dual cameras, AI-assisted goodies, and more. How does all of this translate in terms of image quality though? 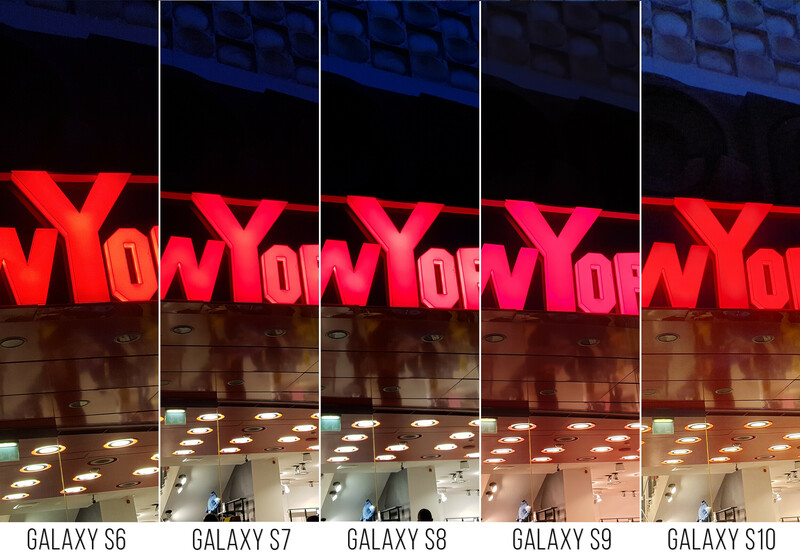 As there's only one way to find out, we lined up the gang and went out on a walk to snap a few pictures and see how Samsung has evolved its camera game. 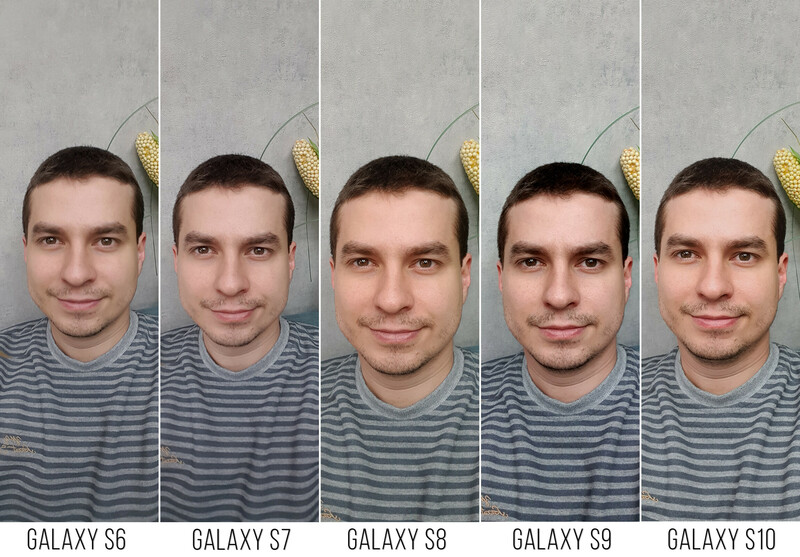 In this particular piece, we will see how the Galaxy S6, S7, S8, S8, and S10 cope against one another in nearly a dozen scenes and explore the evolution of the Galaxy camera lineup. Here are all the 12 scenes that we shot with the five most recent Galaxy flagships, followed by a breakdown of each scene. The full high-res shots with each phone can be found in the linked folder just beneath the gallery right below. NB: The Galaxy S6 has a tighter field of view and a slightly longer focal length; we've done our best to match the composition but have refrained from doing any destructive edits. 9:00 in the morning. The sun was shining brightly on this posh hotel, which I thought would make a neat subject for a daylight shot. Details were aplenty in all shots, but the biggest difference in this shot can be attributed to the saturation of the image. The Galaxy S8 has come up with a rather over-saturated image, which might float your boat but isn't very representing of the real scene. The Galaxy S9 coped the best here, with the Galaxy S10 lacking contrast and making up for a rather unappealing shot. Not many differences in the second scene. All phones have come up with rather identical images, though the newer Galaxies are coping a bit better with the noise in the shadowy areas. A flowering spring orchard tree is always a great sight, yes? I didn't anticipate any major differences in this particular scene, and aside from the slightly purplish image that the Galaxy S8 has produced, all phones have performed similarly. Those who are into super-vivid photos would definitely enjoy the Galaxy S8 in this particular scene, which has come up with an over-saturated image that looks a bit unnatural. 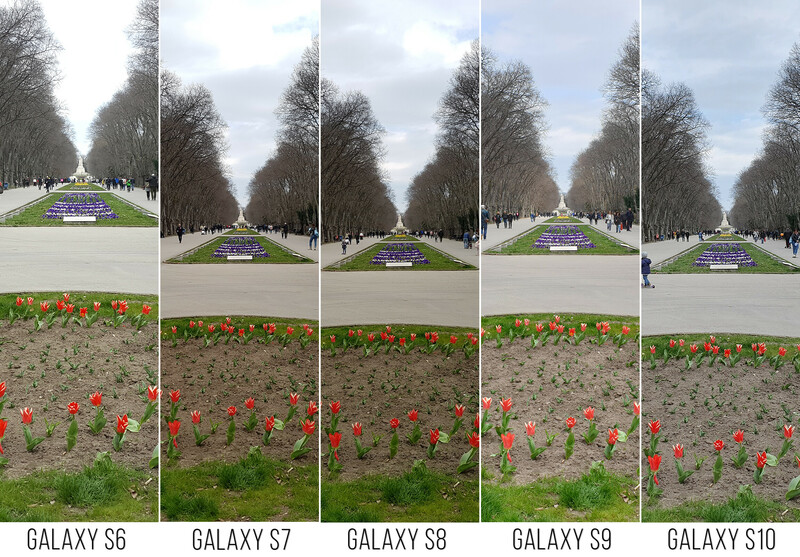 The Galaxy S9 and S10 have come up with the best shots, both more detailed and slightly better-exposed than the earlier Samsung flagships. Shooting colorful neon signs with a regular camera is not an arduous task, but many phones struggle to nail the correct exposure and color of these. This seems to be the case with the Galaxy S8 and Galaxy S9, whereas the Galaxy S7 is closer to the goal. In my opinion the Galaxy S10 has done the best job here, but surprisingly to me the Galaxy S6 hasn't done a half-bad job either! It gets the silver medal here. ...And just as I commended the Galaxy S6 for acing a tricky shot, it quickly rebutted me by spectacularly failing in the next one. 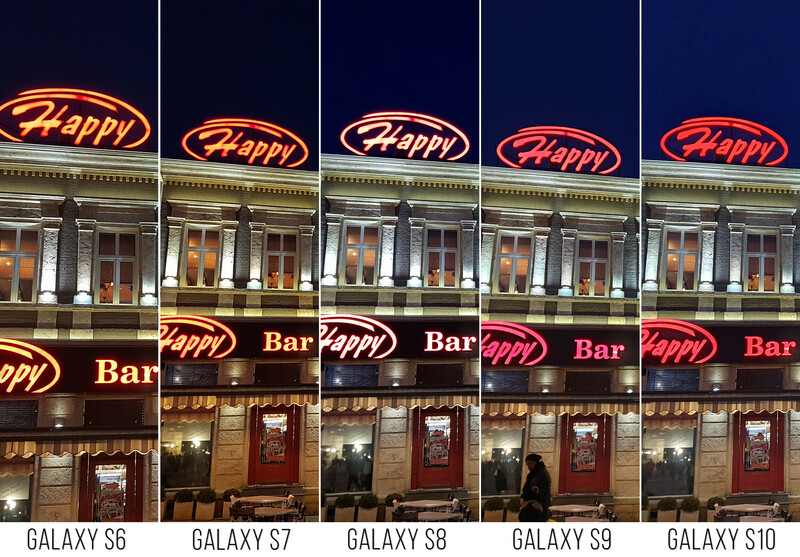 That sign at the top of the building isn't orange, as is the case with the Galaxy S6 and S7, neither should it appear as lifeless as in the Galaxy S8 photo. The Galaxy S9 is close, but the S10 has nailed it. Aside from that notorious sign, the Galaxy S10 has the best dynamic range - there's tons of detail visible in the concrete columns near the windows. 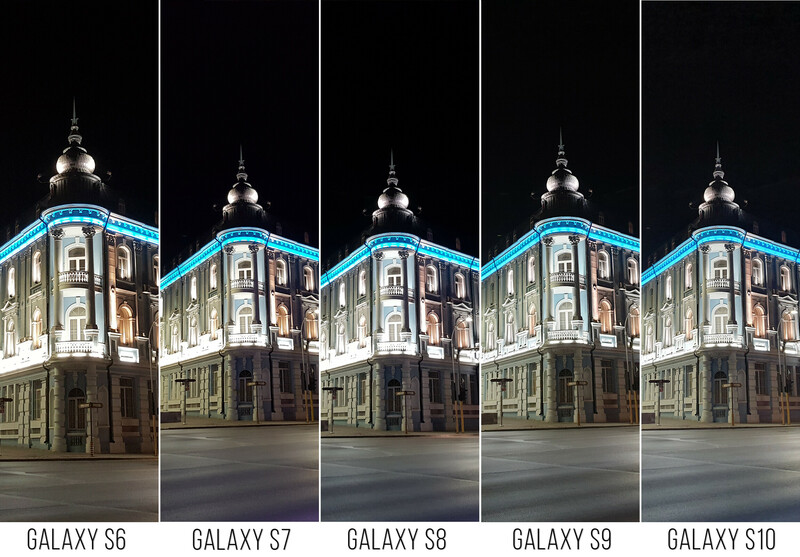 The same applies to the Galaxy S9 to a slightly lesser extent, but both the S6, S7, and S8 have all burned the highlights in this particular area, which is pretty telling. I dropped by the museum next as I was curious which phone would capture the eerie yellow cast on the building correctly. Aside from the Galaxy S9, which has had some problems nailing the exposure, and the Galaxy S6, which has come up with a somewhat "creamy" image, the rest of the phones have mostly nailed the scene. I'd pick the Galaxy S10 image, but in all honesty, the Galaxy S7 and S8 are trailing the new flagship closely. It's the little things - at first sight, you'd be forgiven for thinking all the images look identical. Don't get me wrong, they are, after all that's the whole point of this comparison. 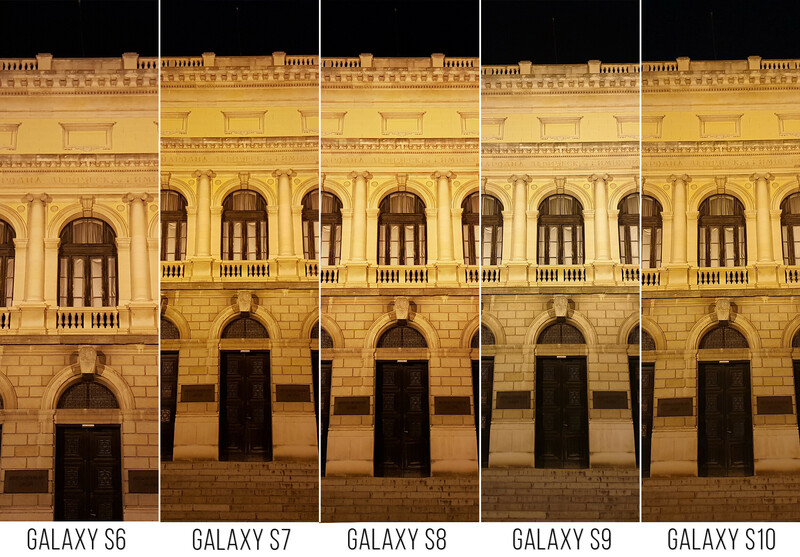 Yet, closely inspecting the strongly-illuminated balusters of the building clearly show how much highlight details the Galaxy S10 and S9 are retaining in comparison with the S6, S7, and even S8. 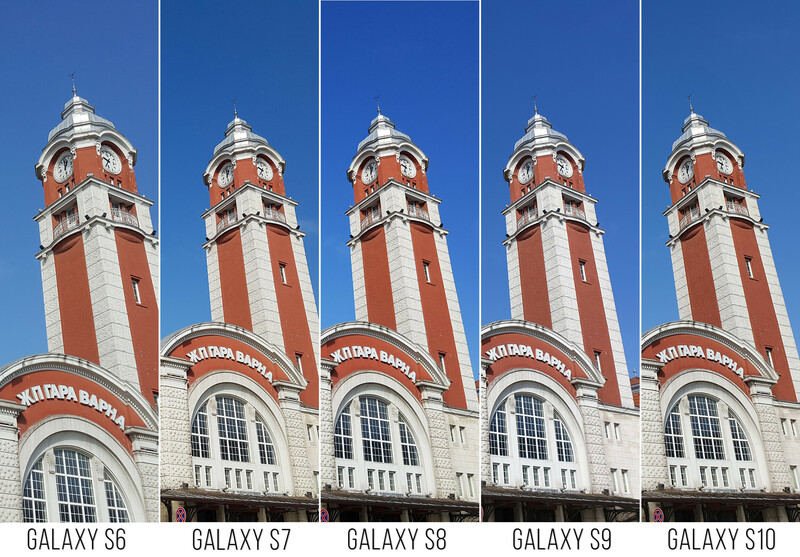 The magic of HDR is clearly doing its job impeccably in the more contemporary Galaxy phones. 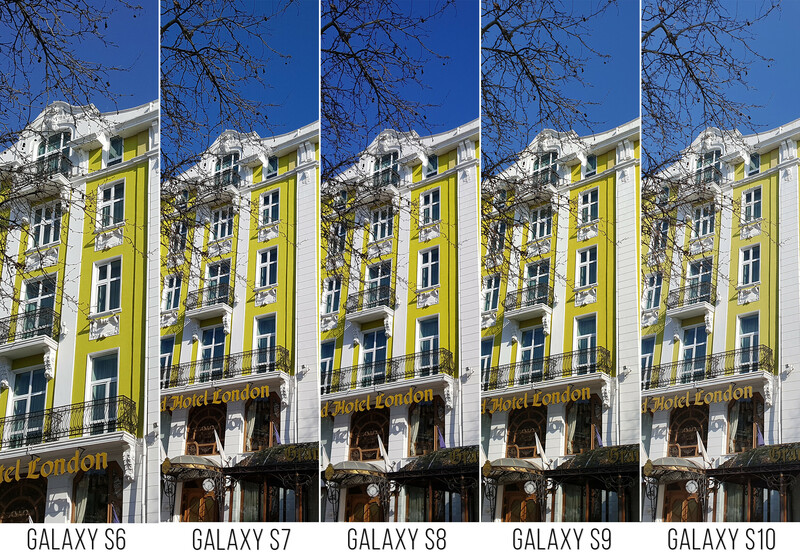 Generally, the same can be said about this particular scene as well - the overexposed sky in the Galaxy S6 sample is slowly transforming into a very well-exposed one once you start climbing up the ladder towards the Galaxy S10. The Galaxy S9 has also done a rather good job here. Scene optimizer has been left at its default state - enabled - on both devices. Selfie time! This one was taken in a dim café where the lighting wasn't particularly favorable for a good-looking selfie. That said, I absolutely abhor how I look in the Galaxy S9 and Galaxy S10 selfies. I promise I don't look that scary and unhealthy in real life. I like myself the most in the Galaxy S8 shot, and no, I won't change my mind. Have in mind that all beautification filters, modes, and shenanigans have been turned off on all phones. The following selfies were taken by my colleague George in a well-lit studio against a rather uniform background, which should bring out the best selfie capabilities of the front-facing cameras. The Galaxy S10 and S9 have performed excellently in this scenario. It might be largely subjective, but I prefer the Galaxy S9 selfie here and it would be the one I'd share on social media if I was George. George agrees with me, by the way. In this scene, the Galaxy S10 exhibits the best dynamic range and is the only one in which the girl's forehead is exposed evenly. 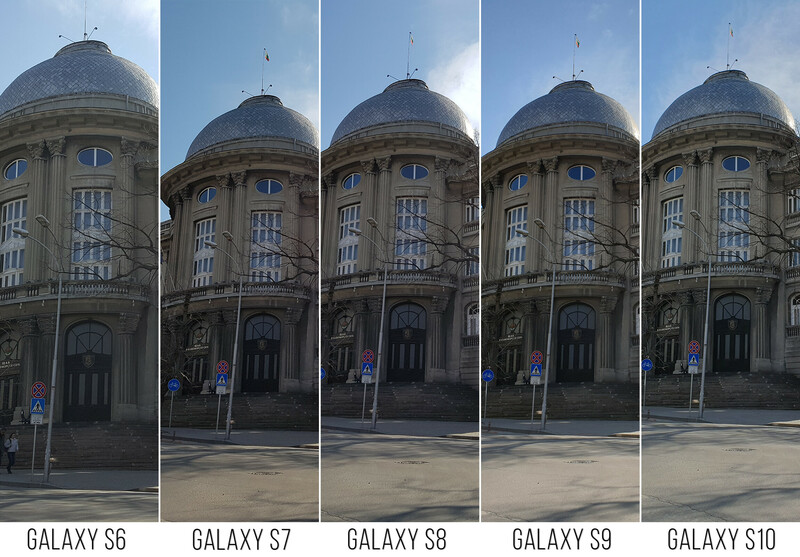 Actually, the whole image is exposed better in the Galaxy S10 sample above, with all the other Galaxies coming up with too contrast-y images. 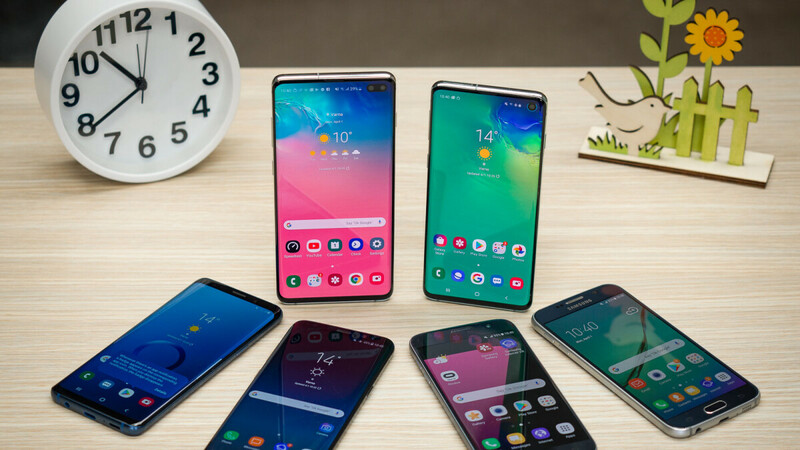 There's no denying that the most recent Galaxy phones have very good cameras that generally outperform their earlier predecessors in those trickier situations that we often find ourselves in our day-to-day lives. While all devices would generally fare quite well against one another in well-lit situations, most improvements can be seen in low-light scenes and scenarios with very diverse dynamic range, which require intelligent application of HDR. 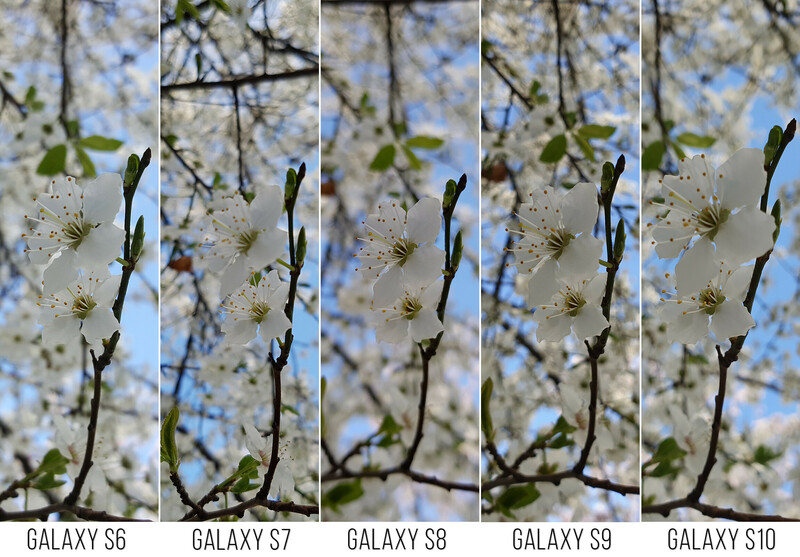 Of course, most of the differences in the examples above could be downplayed and attributed to slightly different shooting conditions between each sample or merely a small slip-up on each phone's part, but overall, the conclusion should be pretty telling: while Galaxy phones have been steadily gaining flashy new camera features and functionalities, the overall image quality of Samsung's phones has also gained noticeable, albeit small improvements. Hate the image quality or not, there's no denying that all the Galaxies posses a certain consistency across the board. If you're a devoted fan of Samsung's Android flagships, upgrading and switching between phones should generally yield consistent results and images with similar merits. Samsung does a good job, but not an impeccable job. It's "always a bridesmaid, never a bride" Yes! Apt intro. Appreciate the author for those shots, otherwise Sammy fans will clap their asses until bleeding red. Their achilles' heel is still low light and indoors photography, since the S8, they haven't been able to drastically improve it to match Huawei and Google's phones. To make matters worse, there seem to be a huge difference in their image processing between the exynos and the snapdragon versions, as the exynos version is delivering much softer and overexposed pictures. Like I said in my post below, camera quality has peaked. There's will be no noticeable difference in picture quality between now and 3 years time tbh. What these guys should do is add more genuine camera features. For instance no matter the software optimization, you could never emulate huawei's periscope camera, or wide angle lens, or monochrome sensor, nor can you combat a genuine ToF camera with software. No one is arguing about the benefits of added lenses, Samsung is already covered in that area. It's just that their image processing hasn't been up to the standards that Huawei and Google have set in the past 2 years. Each of these devices has different sensor. The difference is much smaller than companies want us to believe. They should have kept the hardware similar to s6, but with 4:3 sensor instead of 16:9 used by s6. Newer phones had newer sensor, newer software and new ISP of the cpu and still could not give show huge advantage. This right here is the reason I think camera performance has peaked and the why the pixel is overrated. There's no discernable difference between a picture taken 5 years ago and now tbvh. The average Joe (which constitutes of roughly over 90% of people) would even in some cases prefer a picture of years ago to that of today. What they should concentrate on is camera features like Huawei and LG has been doing and general innovative breakthroughs in both design and technology (Moto mods, rumored Moto Razr phone, Galaxy Fold, huawei's reverse wireless charging, longer lasting batteries, Motos software add on's, Huawei's IR blasters) or meaningful breakthroughs that could either genuinely change the way we use our phones (Moto mods, entire alternative new UI), or make life extremely easy and convenient (Huawei's Reverse Wireless charging and proprietary fast chargers and Huawei's IR blaster) or instantly wow from a design perspective (Rumored Motorola Razr and the Galaxy Fold), or even save costs generally (longer lasting batteries). instead what we get is repeatedly releasing recycled slabs year in year out. Infact, 'New Phones' stopped becoming a thing years ago imo. The S6 to the S7 had a pretty big difference if you ask me. Yeah, the colors and lighting (and whatever other lingo I'm missing) is pretty similar, but getting a wider lens is a pretty big feat. I'm about 90% there in totally agreeing with you, but I'm trying to give some benefit of the doubt to OEMs that progress has been made over the past 5 years. We can swing the discussion however we want to show that we're right and they're wrong, so I'm hoping that someone somewhere can convince me otherwise. The S7, S8, S9 and S10 use a variation of the same 12MP/1.4um sensor with dual-pixel technology. I have both s6 & s8+. This articles confirms why I hate the s8 camera. Only the S9 I see performed better than the s6 with the s10 not consistent. S7 & s8 camera don't have good colour reproduction. I also take more blurry pictures with my s8+ while my s6 is usually on point & its images are sharper especially texts. I like this write up. I see so many comments and comparisons to Huawei and Pixel devices. Catch is, those devices are NOT widely accessible. Over 2/3 of American mobile consumers which make up the vast usage of the high end market do not use Verizon for Pixel carrier availability and cannot or will not buy Huawei thanks to carrier's rebuffing and the US Government sanctions. Samsung is largely competing against Apple and LG. Samsung does not have to have a better camera than the Pixel or Huawei. Samsung simply has to appeal to a mass market. No commercial or fan buy internet post will change that. Apple and LG are low hanging fruit with unimpressive mobile imaging. LG? This is 2019, and LG are struggling to compete in whatever market you wanna mention. And the US is the only country where Huawei phones aren't available, but they're doing a great job in almost every other market, their P and Mate lineup are selling like hotcakes, and they are second to Samsung in overall sales around the globe, and with the momentum they're going at, it won't be long before they become the number one smartphone maker in the world. And these are my friend, facts, supported by numbers, not an opinion based on emotions. No one buys Huawei in India. Its only the Honor brand which is the mid range of Huawei Rest in high end its Samsung n Apple. 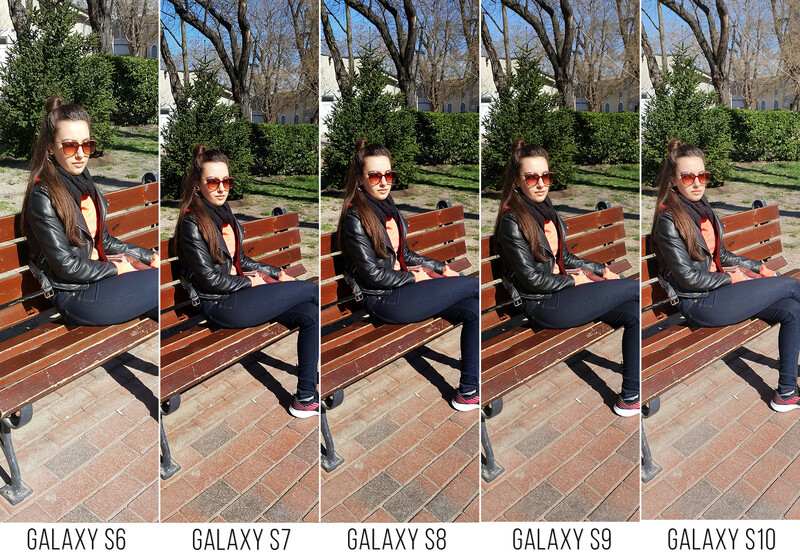 There is a reason why Samsung and other manufacturers add telephoto lens, and ultra-wide lens in their flagships.